It's kind of fun to go exploring, taking a turn here and there, not knowing where in the heck you're headed. The paths seemed to be endless, snaking through wide meadows and little copses of trees. Since we knew the river was to our east, it was pretty hard to get very lost. The Preserve had been restored after the creation of the Ice Harbor Dam. About a billion birds sang to us from the trees and deer scampered away from us. 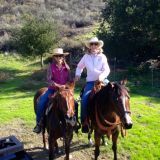 At one point, I was behind Anita, when suddenly there was a flutter of wings and feathers that burst from under her horse. He spooked and spun. Arizona spooked and spun. I found myself hanging on the side of the saddle, my legs gripping him like a crab, both hands on the horn. He stopped (good boy) and I got my seat back where it belonged. He blinked a couple of times and shook his head, I petted his neck and on we went. Some horses would hold on to that fear, but he just mozied on like it was just another one of those things. No big deal. 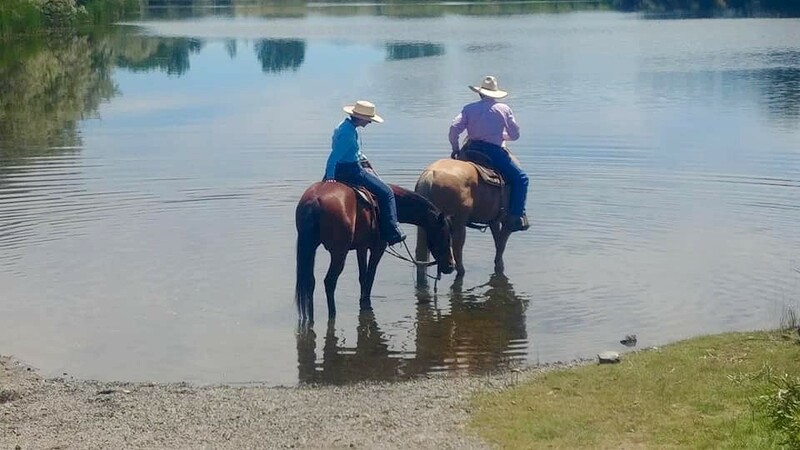 Back at the trailers, we stopped by a family of fishermen so the little girls could pet all the horses, then we rode up to the boat launch area to give the horses a drink of water. Arizona walked right in behind Roy, dropped his head and took a big drink. We stood there, enjoying the view, enjoying the day, enjoying being alive. As I picked up my rein to turn to walk out, feeling so tickled that Arizona seemed to like the water, he picked up his right foot to paw... "No, no, no, no, no!" I kicked him ahead. I did not want to get wet. It could not have been a more perfect day.